Earlier this month I posted information about a crazy idea: hiking the Appalachian Trail in one day. That’s right — 2,176 miles in 24 hours. If you imagine one hiker attempting such a feat, that person would need to hike — fly, really — more than 90 miles an hour. That idea, of course, flies straight in the face of what’s possible. A different idea — wonderfully crazy but at least theoretically possible — came to Dartmouth College student Matt Dahlhausen after a hiking trip in the White Mountains during his freshman year. Matt is a member of the Dartmouth Outing Club (DOC), which this year is celebrating its centennial. More than half the students at Dartmouth belong to the DOC, and nearly every one of the college’s thousand entering freshmen is introduced to Dartmouth, the mountains of New Hampshire, and the DOC during a 5-day “first-year trip” that ends at the Ravine Lodge on Mt. Moosilauke, a remote mountain retreat owned by the college and maintained by the DOC. 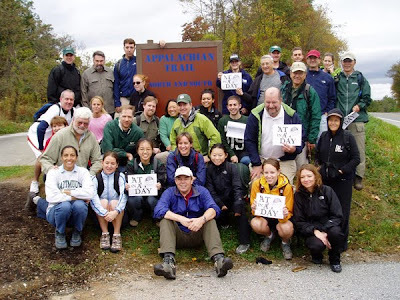 In the spring of 2008, Matt Dahlhausen suggested to a couple of fellow DOC members that the club help celebrate its upcoming centennial by hiking the trail collectively — hundreds of students and alumni stitching together every section of the trail in one 24-hour period. He was just tossing out an idea, the kind of Wouldn’t it be great if.... that fuels many a late-night bull session but usually goes nowhere. “AT in a Day,” though, shared a characteristic of many great ideas — it was both simple and audacious. His idea took hold, and then it took off. Matt had also learned something about the combination of leadership and the outdoors as an Eagle Scout in Troop 22, Cleveland Heights, Ohio. Before long, he and several other students were in charge of the “AT in a Day” project. They set the date of the hike: October 10, 2009. Over the next months, they tried to figure out how to tackle the project. They built a website with an interactive map of the trail. They sliced the trail into 21 sections of roughly 100 miles each and began looking for section chiefs to recruit hikers for their sections. A core group that included Matt and co-chair Athena Aicher also sent word of the hike out to DOC alumni. When they were ready to start signing up volunteers as section chiefs, they sent an email to that group; within 24 hours, alumni had spoken for 11 of the 21 sections. However, college students, even organized and ambitious ones like Matt Dahlhausen and Athena Aicher, operate in pulses. They worked hard on the project throughout their sophomore year, but fell behind during the summer leading up to the big event. They started their final push when fall classes resumed after Labor Day, leaving less than for all the pieces to come together. Much of the trail seemed to be covered. Wayne Bardsley, a 1970 graduate of Dartmouth and section chief for the 41 miles of the AT that traverse Maryland, had organized 50 hikers and a post-hike party. Members of the Dartmouth cross-country ski team were poised to hike the rugged 100 Mile Wilderness in Maine, considered the single most difficult section of the AT. One DOC alum planned to fly from New Hampshire to North Carolina to hike a section of the trail that he’d maintained after graduating. Ninety-one-year-old Henry Merrill, who had met his future wife at the Ravine Lodge as a student, would hike the part of the Appalachian Trail that crosses the Dartmouth campus. All told, more than 900 students, DOC alumni, and friends of the Appalachian Trail had made Matt Dahlhausen’s crazy idea their own. But with time running out, a look at the map showed a problem: the farther from Dartmouth and its big Northeastern concentration of alumni, the more gaps appeared in the map. The gaps were biggest below Roanoke, Virginia. During a final round of furious planning, the group expanded its call beyond Dartmouth and the DOC. The organizers sent word of the single-day effort to what the Appalachian Trail Conference calls “maintainer groups,” focusing on the places they needed the most help: Tennessee, North Carolina, and southern Virginia. People registered on the site; two difficult and remote sections of the trail in North Carolina, totaling about 50 miles, were claimed, though it worried Matt that the hikers who signed up for those segments did not send confirming emails. Early in the afternoon on Friday, October 9, Matt headed south with a dozen other students in three vans. The day before, he’d scrambled to put together a plan to cover about 170 unclaimed miles in southern Virginia. He’d hoped that at least 20 students would answer his urgent campus-wide appeal, but 16 hours was short notice. Still, beyond the Virginia section that they were headed for, only 13 miles in North Carolina remained unassigned. It was possible — still crazy, but possible. Matt’s group arrived at a gas station in Waynesboro, Virginia, at 6 on Saturday morning. He hadn’t slept at all the night before. Still, he thought they could pull it off — if each student hiked 20 to 25 miles... But they had trouble finding trailheads. Matt and three others, starting well past noon, hiked just 12 miles of the trail south of Pearisburg. They could have pushed farther, but had agreed to follow safety guidelines that put them back in the vans before dark. They returned to Hanover knowing they hadn’t made it — but not knowing how close they’d come. Matt is still collating trip reports. He’s received confirmation so far that 2,050 miles were covered on October 10. He hasn’t heard from the folks who signed up for the tricky sections of trail in North Carolina and guesses that those didn’t get hiked. He figures the audacious collective effort probably fell about 100 miles short. But he’s philosophical. “That feeling everyone felt when they stepped out on the trail and felt hundreds of people there with them,” he says, “That was worth more than two years of work.” The education Matt and the other student organizers got through the process is hard to measure, but it’s significant. There’s also a feeling of pride in attempting something that’s never been tried. That’s true in mountain ascents. It’s true in big ideas. The pioneers knock out the route. “Someone else will take what we did and go a little further,” says Matt. It’s how hard things get done. • Dartmouth Outing Club’s historic “AT in a Day” draws nearly 1,000 to the trail. • The Dartmouth Outing Club website contains more information about the “AT in a Day” hike, other centennial activities, and the club. • The Appalachian Trail Conservancy works with state and federal agencies and with about 30 member groups to preserve and manage the Appalachian Trail.